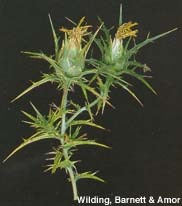 Growth Habit: An erect, spiny plant which can grow up to 150cm in height but averages 100cm. Most of the plant is covered with minute hairs and it is often branched on the upper part of the plant. Type of Plant: Saffron thistle is an annual. Flowers: Saffron thistle has solitary flowerheads at the top of each stem. The flower heads comprise many long, thin, bright yellow flowers. Fruit/Seed: Large brown wedge shaped seeds are released in late summer. They generally germinate in autumn. Dispersal: Saffron thistle has a tendency to grow in dense clumps, rather than spread throughout a paddock, as the heavy seeds drop and germinate near the mother plant. Unlike many thistles, saffron thistle seeds are too heavy to be disbursed by wind. Distribution: Saffron thistle is a major weed of grazing areas in NSW. It occurs in several small patches in Tasmania. It usually occurs in low rainfall grazing areas. Land infested by saffron thistle is seldom grazed properly as the plants very spiny nature deters livestock. This allows plants to grow unhindered, and thus take over large areas of grazing land if left unchecked. Seed may remain viable in the soil for many years, requiring landholders to reinspect and treat infested areas annually for many years to achieve successful eradication. Pasture management (all year). Maintaining a vigorous pasture and avoiding overgrazing will help reduce saffron thistle incidence. Herbicides. MCPA and 2,4-D amine can be used at a lower rate for seedlings and a higher rate for rosettes. 2,4-D ester can be used at a lower rate for seedlings and a higher rate for shooting plants. Clopyralid is also effective. If used during flowering it can reduce seed formation.